Why our general English course? Our general English course is perfect for students who want to improve all aspects of the language. The focus is mainly on speaking and improving fluency through the use of planned discussions, debates and games. Writing, listening and reading techniques will also be taught on this course. The course books we use are well researched and selected specifically to make sure they match our dynamic and engaging style of teaching. Task based activities, with engaging texts and video, make learning enjoyable for our students and gives them confidence to use the language effectively. Students may also make requests to study any aspects of the language that they find challenging. Just let the teacher know at the beginning of the week so he/she has time to prepare something for the class! 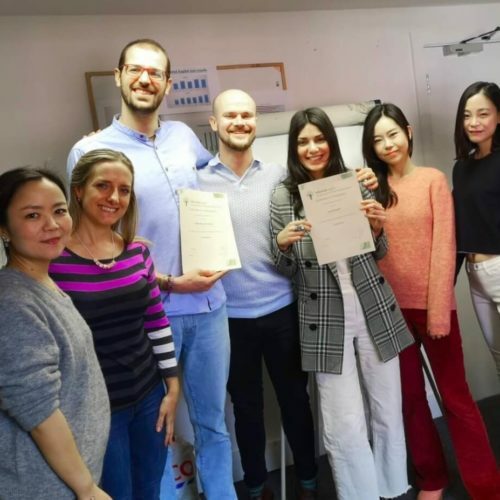 If you are looking for work in London then this course could be very beneficial as interview techniques, and how to write CVs and covering letters are often practiced in these classes too! If you are studying with us for more than 3 weeks they are required to buy the coursebook. Below is a link to amazon where the cheapest options may be available. The current course book is “New English File” – please chose the level appropriately. PLEASE, TAKE THE TEST BELOW TO DETERMINE WHAT COURSE WOULD BE APPROPRIATE FOR YOU.